I like this collection,very much. Excellent performances and selection,to my ears! My cd doesn't have that sticker on it,by the way! 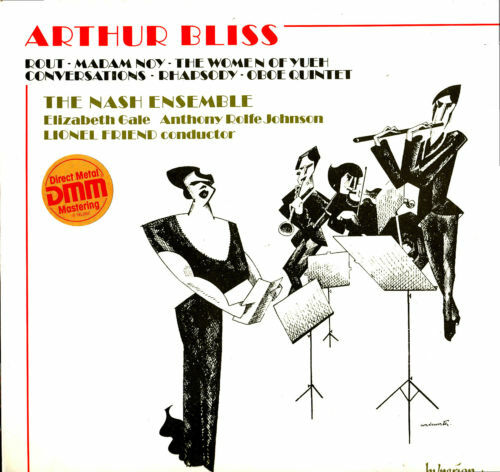 I'd be very interested to hear that version of the Oboe Quintet - one of my favourite works by Sir Arthur. I like everything on the cd;including Rout,Madam Noy and the Women of Yueh. And I usually don't like chamber pieces with people (sopranos,in this case) warbling away. Very inventive,quirky,witty,imaginative music. An utterly excellent cd,imho The sort of cd that makes me think Bliss really does deserve allot better than he gets. Bliss at his best. Just found out about this new release coming in February, a brand new recording of one of Bliss' major choral works, The Beatitudes, by the BBC SO under Sir Andrew Davis. I noted that with interest as well. Having said that the recording of the work on Dutton (first performance I think) did not make much impression on me. However the new recording may help me to appreciate the work. There is a recording on Lyrita as well. Coincidentally yesterday I listened to an excellent EMI CD (Vernon Handley) featuring the fine 'Meditations on a Theme by John Blow' - a powerful and moving work, underrated like much of Bliss ('amiable but rambling' according to the Stereo Record Guide). The CD also featured 'Adam Zero' (Suite) and 'Checkmate' (Suite) including the very atmospheric 'Prologue' often left out in other recordings. They played the new recording of 'The Beatitudes' through on BBC Radio 3 yesterday. I like the music of Bliss very much and it gives me no pleasure to say that I found it so dreary that I eventually switched off. I'm not surprised that they replaced it with Britten's 'War Requiem' for the opening of the rebuilt Coventry Cathedral. As a rule I listen to much more of the music of Bliss than Britten so must try again with 'The Beatitudes' although I shall not be rushing out to buy the new Andrew Davis recording. Today I ordered the Queensland SO recording of Miracle in the Gorbals (complete), Discourse for Orchestra (man, I love that title!) and Music from "Things to Come". I've been buying a lot of Bliss' music lately, including the John Blow Meditations, Metamorphic Variations, and Checkmate (again complete). It often saddens me that not just Bliss' ballets but so many of his contemporaries too have fallen out of the repertoire of ballet companies. The music to "Miracle in the Gorbals" is a wonderful combination of bleak, atmospheric and upbeat. Of course the value of the disc you have just bought is its completeness but as a performance I do prefer the old EMI/Berglund/Bournemouth performance of the Suite right down to the haunting foghorn at its climax. I'd love to see this work staged as well as Adam Zero which seems to have an interesting storyline. I'd love to see RVW's Job too. The Beatitudes does not grab my like Morning Heroes but it is growing on me. The new recording is not helped by an overly discrete organ. Not a problem for the 45th President I think. I think that Bliss is rather underrated. He may not be quite up there with VW etc but I often return to his music. I've recently been enjoying the 'Hymn to Apollo' which may have links to Bliss's plea for healing after the death of his much-loved brother in the First World War. The 'Meditations on a Theme of John Blow' is much more than just 'aimiable but rambling' as the old Penguin Record Guide suggested (they did Bliss no favours by suggesting that the March from 'Things to Come' was the most memorable thing that Bliss composed). I like both of his piano concertos as well as Miracle in the Gorbals and Adam Zero. I haven't yet got on with the Beatitudes but only have the old version on Dutton. 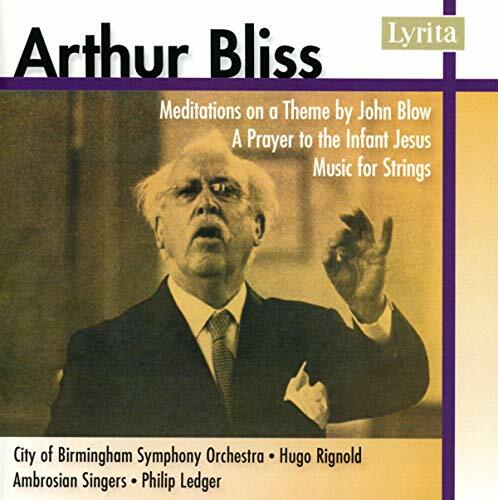 The Lyrita CD with Hugo Rignold conducting the Blow Meditations is a very fine disc and my favourite version of that work. Yes, that Berglund version of Miracle in the Gorbals, originally coupled on LP with the Cello Concerto is terrific. In the Berglund boxed set it features alongside Berglund's powerful and sibelian recording of Vaughan Williams's 6th Symphony. The Bliss I kept and still enjoy ocassionally: Morning Heroes, String Quartets and a nice disc with the Cello Concerto, Hymn to Apollo and the Enchantress. On receiving the Gold Medal of the Royal Philharmonic Society in 1963, he [Bliss] said, "I don't claim to have done more than light a small taper at the shrine of music. I do not upbraid Fate for not having given me greater gifts. Endeavour has been the joy". I forgot to mention Morning Heroes, possibly his masterpiece. I think that Bliss was an endearing person by all accounts. I do find some of his works memorable, including the ones I mentioned above and also the fine Oboe Quintet. If you find them memorable,you find them memorable! What can you do? Forget them?! But you can't ,because you find them memorable! I like the works on that Hyperion cd (see earlier post). One of my favourite Bliss cd's,and possibly my favourite. Rout,The Women of Yueh,Conversations,Rhapsody and the Oboe Quintet,are fine works;and strike me as Bliss at around his best. The Nash Ensemble give fine performances. A superb cd. I like his ballet music best in the form of suites. I enjoyed the Nightclub music from his Adam Zero ballet,which I hadn't heard before,and was dismayed that it was not included on the emi cd (with Meditations). They left out one of the best bits?!!! Pastoral 'Lie strewn the white flocks' is a rather nice work;and I did like the Meditation on a Theme by John Blow,which I hadn't heard before. I have the emi recording. Miracle in the Gorbals has some atmospheric music. My favourite bit is the Dance of Deliverance. Constant Lambert's recording is ancient,but very good. I also enjoy the Colour Symphony,now and again. I think the climax,in the finale,with all that percussion,is rather thrilling. I'm quite happy with the performance on Nimbus,which is the first one I ever heard. Bliss' own recordings are well worth hearing. He's not one of my favourite British composer's;but I think there is allot to enjoy. Now I see the Bliss thread, it prompted to listen to A Colour Symphony again after a significant period of time. Perhaps I'm going to exaggerate a bit by saying this is one of the best British symphonies (along with those by VW, Walton, Arnold, Elgar, et al), possibly other will disagree. At first I hadn't appreciated the overwhelming lyricism of the Green and Blue movements, there is a special magic that moves me. Because of things like this is that one perceives the listens enhance your perception of works, or at least they refresh your memory by bringing new details you hadn't perceived in previous times. The same happened to the Walton's Symphony No. 2: its rediscovery made me admire it MUCH MUCH more now. Overrated, Underrated, I have no way of knowing how he is "rated." I enjoy a lot of his music. I'd like to hear more. Now I see the Bliss thread, it prompted to listen to A Colour Symphony again after a significant period of time. Perhaps I'm going to exaggerate a bit by saying this is one of the best British symphonies (along with those by VW, Walton, Arnold, Elgar, et al), possibly other will disagree. At first I hadn't appreciated the overwhelming lyricism of the Green and Blue movements, there is a special magic that moves me. Totally agree, especially its overwhelming lyricism is one of those rare moments in music where 'thy cup overfloweth'. Was happy enough to discover A Colour Symphony - echoing the titles of A London and A Pastoral, I guess - during my teens and loved it ever since. So far, surprisingly it's Barry Wordsworth with the BBC Welsh SO that I love most. I agree about the Colour Symphony. +1 and I'm tempted to listen to it again following all the enthusiasm here (I was interested to read that Ruth Gipps's 4th Symphony is dedicated to Bliss). I like the Groves recording of 'A Colour Symphony' but also Bliss's own and following Christo's comments need to revisit Wordsworth's recording. I like Groves' "Colour Symphony" very much - classic EMI analogue with the RPO in great form. I like Wordsworth too but I would put Handley/Ulster ahead of him. But to be fair I don't think there is a poor performance out there. Lloyd-Jones is fine, Hickox I know but not as well as the others - for some reason it did not grab me quite as much as the others. The old Bliss/LSO version suffers from simply not being in the same sonic league as the others and this is a rich and detailed score that needs to allow detail to register. As a composer I think Bliss is under-rated. He is a composer whose scores I collect of and it never fails to impress me just how well crafted they are when you look at them on the page. The harmonic language he uses is more sophisticated than some might immediately think. Technically he is hard to play well too. From his autobiography it is clear he saw himself in quite self-effacing terms - definitely a 90% perspiration/10%inspiration kind of guy. He had a very strict personal routine of trying to write a fixed number of bars of music every day, even if he came back to them the next day and threw them away. Worth remembering all his important work at the BBC as an administrator. Interesting and I agree (although I can't read music). I may have mentioned before that my uncle worked for the Performing Right's Society when Bliss was their President. One day he found himself next to Sir Arthur in the urinal and asked Bliss if he could have his autograph, to which Bliss responded 'as soon as I get my hands free old boy'.